Bill Murray has signed on to voice Baloo in Disney's upcoming "The Jungle Book" movie, which will have a bunch of CG characters and only one actor on screen, Neel Sethi as Mowgli. The new film is directed by Jon Favreau (Iron Man) and co-stars Ben Kingsley as Bagheera, Lupita Nyong'o as Raksha, Christopher Walken as King Louie, Idris Elba as Shere Khan, and Scarlett Johansson as Kaa. It's set to hit theaters on October 9th, 2015. Meanwhile, Warner Bros' competing "Jungle Book" film has been set to hit theaters a year later on October 21st, 2016. It will be directed by Andy Serkis, who's known for playing Caesar in the new "Planet of the Apes" movies, and called "The Jungle Book: Origins." This guy said no to Ghostbusters 3 like he's too good for it, so f*ck him. Besides, there's fifty Jungle Book too many movies already. Go make something new, Hollywood. 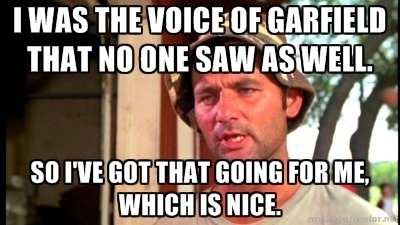 Since Bill Murray is addicted to pot that should give some cool voicing. "fifty Jungle Book movies too many already". This is what you get for not giving us the ability to edit our posts like civilized people, Alex. He wasn't aging well at 20. Download the Calorie In Indian Food trackker. Dolby Atmos APK Download for Android. Google Services Framework apk latest version. Best Radar Detectors 2017 reviews. Hotmail login refers to Outlook login. If you are new here, we guide you thoroughly and make you create new Hotmail login account. Hotmail account requires to Hotmail sign in action. Without Hotmail account you can not sign in or login your Hotmail account. Hotmail is now Outlook if you go through history of Outlook. You can find that, previously Outlook was know as Hotmail. According to Hotmail wikipedia, Hotmail is founded in 1996. The newest app in the smartphone world is Lucky Patcher. It is an amazing app that allows you to control all other apps that you have installed in your smart or Android phone. Lucky Patcher offers complete control on all other apps to modify all developer mod options with some easy steps and few clicks. With this app, it is feasible to disable the unnecessary advertisements and continue using the app without consuming too much of your time. You can even alter the permissions to apps whether they can access your media or phonebook section or not and also it allows you to create backups for all sorts of apps. Lucky Patcher is an Application that gives you Real Control over the Permissions you give to the Apps installed on your Android.Download Lucky Patcher APK File from here. 새로운 영화는 Jon Favreau (Iron Man) 감독과 바 킹라 (Benheela)의 벤 킹슬리 (Ben Kingsley), 락샤 (Raksha)의 루피타 니옹 (Lupita judi togel Nyong'o), 루이 왕의 크리스토퍼 워켄, 쉐어 칸의 이드리스 엘바, 카아의 스칼렛 요한슨과 공동 출연한다. 2015 년 10 월 9 일에 극장을 강타 할 예정입니다.